Among the flotsam and jetsam plucked from the Atlantic Ocean following the Titanic's demise were pieces of wood. William J. Parker, a carpenter aboard the rescue ship Minia, fashioned pieces of Titanic's wreckage into various items. 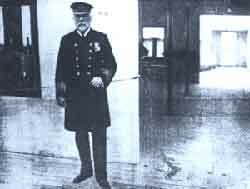 He made a liquor cabinet from the wheelhouse door and other salvaged wood which he gave to Chief Officer James Adams. The wreckwood pine piece above was a shelf in that cabinet. It is authentic pine wood from the Titanic, indicating it's most likely from the deck. It is presumed deck wood probably came from the breaking point just before the final plunge. It was passed down to Adam's grandson. Later it became part of the private collection of a world renowned Titanic author/expert and displayed at Orlando's "Titanic - Ship of Dreams."